Life just wouldn’t be the same without scrumptious recipes like this. Now this particular recipe calls for homemade pizza dough because when it come to stromboli I think it makes all the difference in the world. 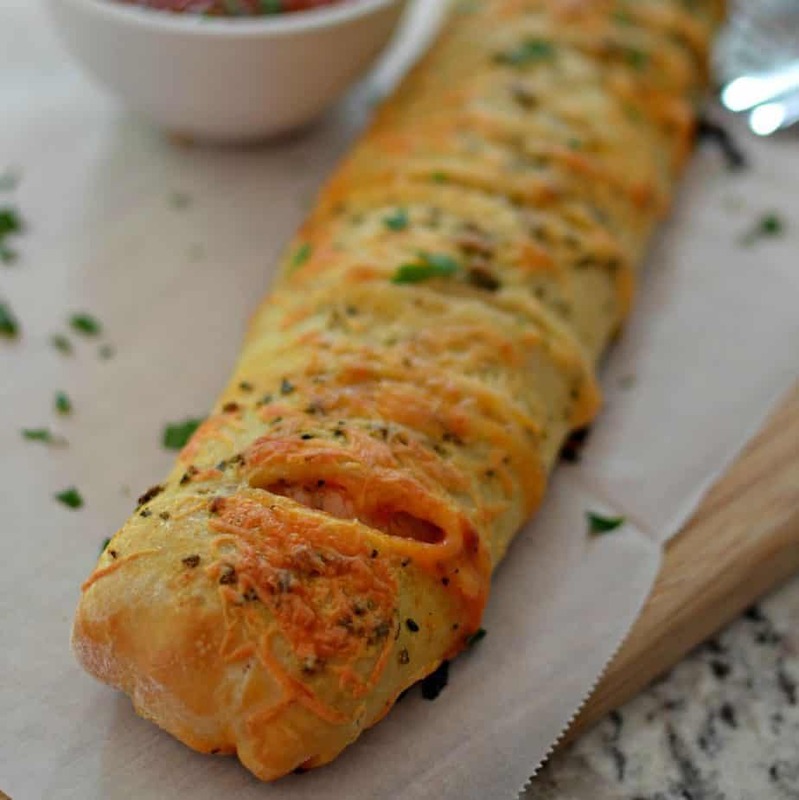 This beauty is stuffed with marinara, pepperoni, sweet ham and mozzarella however there are many choices when it comes to stuffing a stromboli. First prepare the pizza dough. Dissolve the yeast and sugar in water and wait about ten minutes. Mix salt, yeast mixture, olive oil and flour in a stand mixer with dough hook attached. Add the flour 1/2 cup at a time until the dough pulls away from the side of the bowl. Turn on to floured surface and knead for about four minutes. Divide the dough in half and roll out two rectangles. You can also take half the dough and wrap up and refrigerate for later use. Pizza dough is at its best for about three days if wrapped properly and stored in the refrigerator. Melt butter and add garlic powder, basil and oregano. Lightly brush pizza crust with herb butter. Spread shredded mozzarella over the crust, followed by ham, a thin layer of marinara and pepperoni leaving a border all the way around. 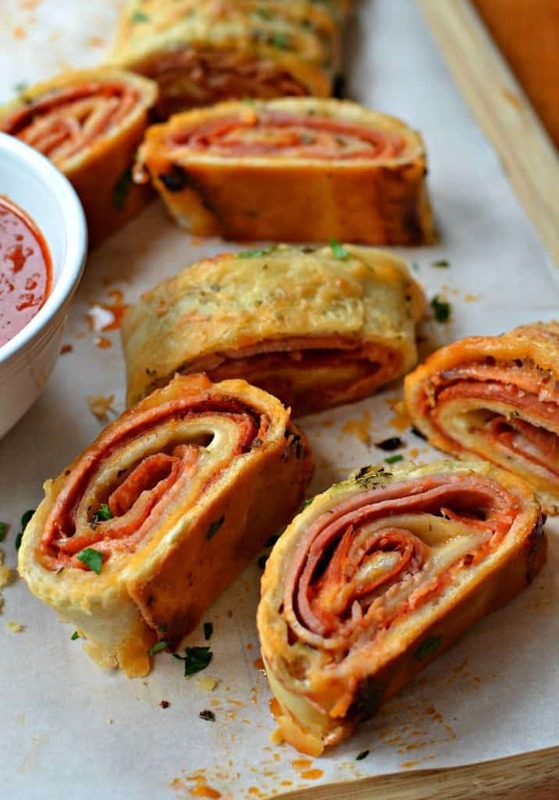 With the pizza crust turned lengthwise roll up like you would cinnamon rolls. Place on cookie sheet and brush with egg wash, a little more herb butter and a sprinkling of mozzarella. Cut slits in the top diagonally every inch and bake. CAN YOU MAKE PIZZA DOUGH AHEAD OF TIME? The pizza dough can be made up in advance. Tightly cover the pizza dough with plastic wrap and store in the coldest part of the refrigerator for up to three days. After three days it is still edible but the quality of the dough begins to degrade. To freeze double wrap and store for up to three weeks. Move frozen pizza dough to the refrigerator the day before use to thaw. HELPFUL HINTS FOR MAKING THIS STROMBOLI RECIPE AMAZING! Roll the pizza dough out on surface lightly covered with flour. Move to baking sheet after rolled out. If the pizza dough seems to be springing back when you roll it then give the gluten time to relax in its new flat shape. Roll it out, wait 15 minutes, roll it again, repeat if necessary. If pushed for time some grocery stores have ready made pizza dough. Call ahead to check. Leave a 1-2 inch border around the pizza dough so you can pinch and seal consequently leaving all the goodies cooking inside. Place the Stromboli on cookie sheet seam side down. Make sure you brush the top with egg wash, herb butter and a sprinkle of mozzarella. Bake in center of preheated oven uncovered. I can not tell you enough how delicious this Stromboli is. It makes for the prefect party appetizer or family dinner. 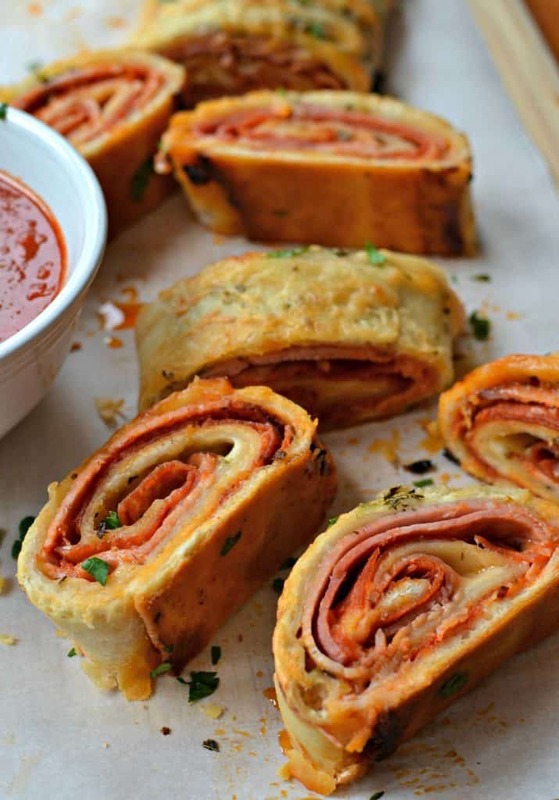 Do yourself a huge favor and make this amazing Stromboli Recipe today! More delicious appetizers you will love!! This post was originally published July 28, 2018 and was republished March 6, 2019 with new content. This Stromboli Recipe includes an easy made from scratch pizza dough along with helpful hints on mastering the stromboli and making this recipe epic. In a small bowl mix together yeast, sugar and water. Let it sit for about 10 minutes for the yeast to activate. If the yeast is active small bubbles will form on the surface. In the bowl of your stand mixer using dough hook add salt, yeast mixture and olive oil. Begin adding flour about 1/2 cup at time. Continue to add flour 1/2 cup at a time until the dough starts to pull from the sides. Knead the dough for 3-4 minutes on a well floured surface. Split dough in half. Roll dough out on lightly floured surface to an approximately 10 x 13 rectangle. Move dough to baking sheets. Melt butter in small microwaveable bowl. Stir in basil, oregano and garlic powder. Brush over the laid out pizza crust. Sprinkle each crust with 1 cup of shredded mozzarella leaving a 1 1/2 inch border all around the pizza crust. Layer with ham leaving same border. Divide pizza sauce and spread over ham keeping off of the border. Layer with pepperoni overlapping again avoiding the border. Turn the pizzas horizontally in front of you and gently roll the pizza dough into logs sealing the edges as you go. Place seam side down on baking sheets. Brush with beaten egg. Brush the tops lightly with the butter/herb mixture. Sprinkle each Stromboli evenly with the remaining mozzarella. Cut slits diagonally in the top about 1 inch apart. Bake at 375 degrees for 20-25 minutes. Slice along slits and serve with extra marinara. That looks so good! I can’t wait to whip these up for the weekend. My family is going to love them. This looks so good, i have made similar for the kids pack lunches and they go down a real treat! My pleasure. It is so delicious! I am sure you and your kids will love it! Boy, the homemade pizza dough, ham, pepperoni and mozzarella sold me! Delicious! Thank you! It is amazingly delicious!! This is my husband’s favorite thing to eat. I never thought to try to make it myself. This was a huge hit! I loved it! So tasty and delicious! Wow, good thing it’s almost lunch time. This looks incredible and is making my mouth water. I’m not kidding that I’m going to make this today. haha, thanks for the food inspo. My pleasure Tonya! I hope you enjoy as much as we do! 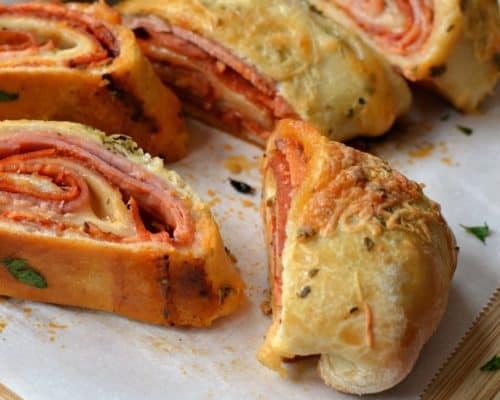 I have never had a stromboli but this looks delicious 🙂 The recipe seems easy but not sure if I ( a novice) ever can make this! It is delicious. You should try it! 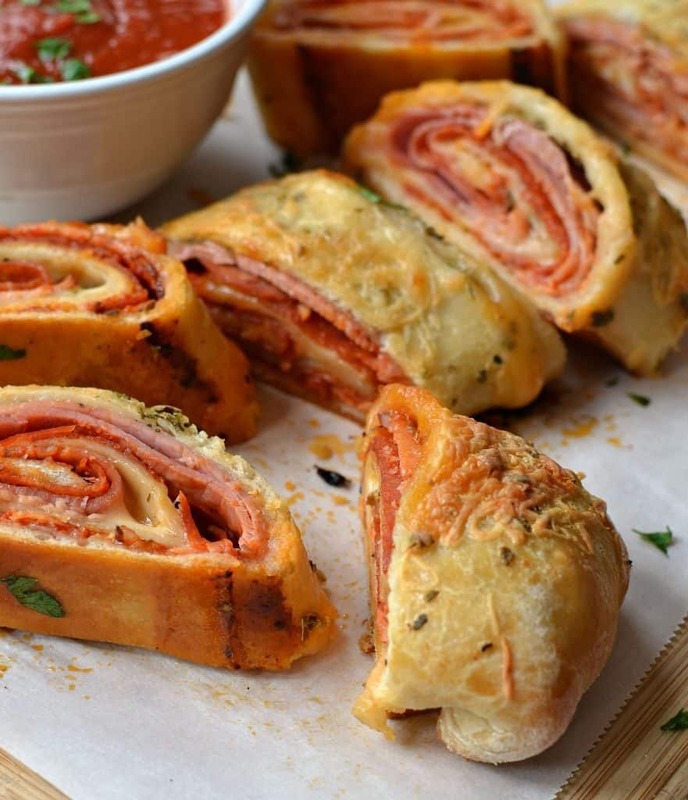 These Stromboli looks nice to prepare with the family. I like learning new recipes by reading posts like this one. Thanks for sharing. I love Stromboli! I always order it when we visit the pizzeria or Italian restaurant. This recipe looks so easy, I should just make it at home! Yes should try it! So darn delicious!! it sounds perfect for an aperitif! A good glass of wine together with your stromboli roll are just perfect! I could not agree more! Delicious!! Would you believe that while I was at the grocery store today, I thought about a conversation I had with a coworker a while back. She told me she made strombolis for the first time and how easy they were. This was years ago, but I literally thought about it this afternoon, and then I stumbled on your recipe! Clearly I need to make these this weekend! That is fabulous! I hope you love it! My middle child is in love with anything resembling pizza. She seriously wants to be a “pizza maker” when she’s older (she’s 6). Basically, she loves any Italian food! This is right up her alley! Looks like a winner! This looks so mouthwatering, my kids would probably like this, this is a big help. Could this be put together ahead of time and frozen before baking? Yes Jen you can. Skip everything in step 6. Double wrap in plastic wrap removing as much air as possible. Move to refrigerator 24 hours in advance to thaw. Let it come to room temperature. Unwrap and complete all in step 6…egg wash, butter herb mixture and mozzarella. Bake as directed. It may need a couple of extra minutes of baking time. I’ve never heard of Stromboli before but the photos have me intrigued. I’m on my way to the supermarket to get the ingredients so I can try it out now. Ok! So tomorrow I’m going to make this and my family is going to love it! Thanks for sharing the recipe with us! You are most welcome Ana! I hope you enjoy it! Will definitely save the recipe. I will have more time to work in the kitchen now that the kids will have their school break in a few weeks from now. I love Stromboli’s it’s so delicious and one of my favorite dishes. The one that you created looks so much more delicious than our pizza restaurant. I am not sure if I can make it as good as your though, lol. We made this the other day! Delicious and was fairly easy to make and my children loved it. Thank you for the great recipe and detailed instruction. You are most welcome! I am glad that you liked it!! Oh. My. Yum! That looks so good! I want this for dinner asap! It’s been a long time since I’ve had a stromboli!!! I have to make these! Thanks! I hope you enjoy as much as we do! i LOVE stromboli but never had the guts to make it. This recipe looks easy enough! I am so glad I found one that sisn’t too complicated. Now if I could just perfect my tomato dipping sauce. Thanks Jeanette! I hope you enjoy it as much as we do! Love this recipe, especially that it’s entirely from scratch, homemade dough is the best for sure. Yes indeed. It really is! This look unbelievably tasty and not too difficult. When I’ve made pizza dough in the past, I let it sit for about 45 minutes after it’s all mixed together. I’ll be interested to see how this technique works without having the wait out the rising time! I hope you enjoy! Delicious! I love stromboli!